Firstly I wish to make it clear that I am not a Vegan, in fact I am not even a vegetarian. However, I always have at least one meat free day a week and I regularly include plant proteins in my meal planning for their fantastic bioavailability. Two of my favourite sources are Tofu and Tempeh. I love being able to manipulate the flavours and textures for increased variety. You can imagine how thrilled I was to be asked to review an incredible new product which enhances your Tofu culinary experience. If you are a regular consumer of Tofu, you will no doubt have experienced the “Tower of Tofu” scenario in your attempts to press it. 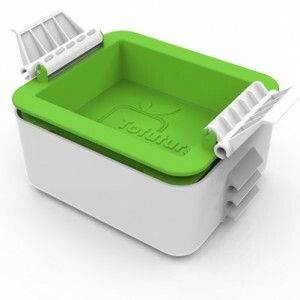 This ingenious product from ToFuture irradicates all of those tower disasters when your precariously balanced lunch topples off the worktop into the abyss of the kitchen floor. Pressing your tofu is mandatory for creating the perfect texture sensation, so in all honesty this extremely reasonably priced gadget is a true must have for any coinosseur or someone wishing to enhance their experience. Perhaps the lovely people at Tofuture could experiment with a variety of colours and to help me out a nice white and duck egg blue combo would be fabulous. This unique design retails at £23.99 from their website and you can be safe in the knowledge that it is approved by both the Vegan and Vegetarian societies. If this sounds like the solution to your problems you can purchase it by clicking on this link. I couldn’t recommend it more for perfecting your ToFuture and gastronomic adventures.